Peter Long on Chess: Conspiracy Theory Revisited? Some time back, 18 May 2014 to be exact, I made the following post on what I felt was Ilyumzhinov desperately looking to move the Olympiad (see http://www.thefidetrainer.com/2014/05/conspiracy-theory.html) and of course with it the FIDE Congress in an election year. This FIDE has two standards of behaviour, with what we are seeing with the likes of Norway and South Africa where they do not engage organisers professionally but through arrogant heavy handed public confrontations, but when it is with those in their inner circle then it is all secrecy, buddy buddy and often with a complete disregard of rules. It is clear that Ilymuzhinov is increasingly desperate as despite both illegal and thuggish behaviour that has surpassed all previous election campaigns (for a sampling, see http://www.chess.com/news/crimea-conflict-on-the-chessboard-4611 and http://www.chess.com/news/ilyumzhinov-vs-kasparov-whats-going-on-with-afghanistan--gabon-7142), it is only in Russia (or in a Putin vassal state that he can assured of winning. These kind of people are not difficult to read given their mentality and the environment they operate in and after FIDE failed when raising doubt of the Olympiad funding, the first new first sign of they had not given up was the publishing of a so called open letter http://www.fide.com/component/content/article/1-fide-news/8134-presidents-letter-to-the-prime-minister-of-norway-.html. Of course Ilyumzhinov had done his homework (see http://www.chess.com/news/anand-carlsen-world-championship-to-be-held-in-sochi-1555) to have Putin and Russia already save FIDE over their inability to attract sponsorship for the World Chess Championship. 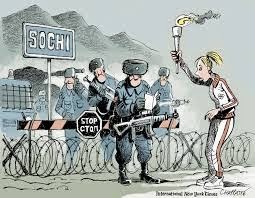 So the question now is will Norway's refusal to accept the late entry of the Russian women's team be sufficient excuse for a FIDE desperate not to lose the election to actually cancel arguably its biggest event just weeks away and perhaps move it instead to Sochi, or any of the usual Russian suspects such as Khanty-Mansiysk? That would be beyond belief given the legal and financial ramifications... then again what is impossible with a dictator-despot like Ilyumzhinov? He claims to be a Buddhist but exhibits no conscience or morality whatsoever (see http://kasparov2014.com/2014/07/15/open-letter-from-grigoriy-yavlinskiy/), and in his fantasy world visits with chess loving Aliens (see http://www.independent.co.uk/news/people/profiles/kirsan-ilyumzhinov-chess-came-to-earth-from-outer-space-2085838.html and http://www.newyorker.com/online/blogs/newsdesk/2011/06/kirsan-ilyumzhinov.html.). so, what say you now that the organizers have backed down? They made the right move... and gave the election a chance!